On Broad Street, on the fortified wall close to the Square Tower. the entire coastline of the then unknown continent of Terra Australis. 24th October 1810, giving Terra Australis the name of Australia. A new plaque to honour Captain Matthew Flinders, a Royal Navy navigator, will be unveiled at the Square Tower in Old Portsmouth on 19 November at 2.30pm. Flinders returned to Portsmouth 200 years ago following an expedition to successfully circumnavigate and chart the coast of Australia. He was one of the most skilled navigators and hydrographers of his age, following in the footsteps of Cook and Bligh, he also identified and corrected the effect upon magnetic compass readings of iron components in wooden ships, giving rise to the universal 'flinders bar'. On his return to England in 1810 he completed writing-up his journal and correcting the charts of the voyage which were published under the title A Voyage to Terra Australis in 1814. He also proposed the adoption of the name AUSTRALIA for the continent, which had previously been referred to as either New Holland (in the west) or New South Wales (in the east). 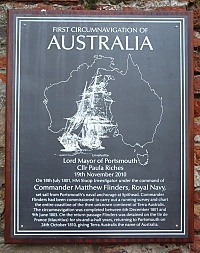 In recognition, the city has been working with the Society for Nautical Research (South) and the Association of the Britain Australia Society (Portsmouth Branch) and the Portsmouth-Sydney Sister City Committee to place a plaque upon the wall at the Sallyport adjacent to the memorial recording the departure of the first fleet from Portsmouth to Australia in 1787. The plaque honouring Captain Flinders will link the two key historic events in the founding of Australia. The Lord Mayor of Portsmouth Councillor Paula Riches, who will be carrying out the unveiling ceremony, said "I am really proud that our city has a part in the story of such an accomplished person as Captain Matthew Flinders. Building bridges with other cities around the world is great news for Portsmouth I hope this undertaking will further strengthen our ties with our sister city of Sydney." In addition to the Lord Mayor the Consul General representing the High Commission of Australia will be present. Sydney has a historic link with Portsmouth – the first convicts to arrive "Down Under" sailed from our city. The official sister link was formed in 1984, in time for the bicentennial anniversary of the sailing of the first fleet. An Australian Settlers Memorial of two anchor links can be found in Sally Port and there is an identical memorial in Sydney.